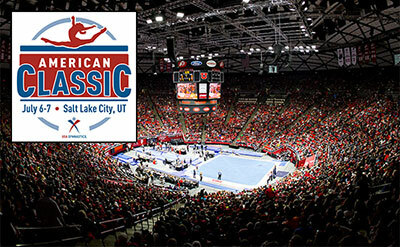 SALT LAKE CITY, July 5, 2018 – This weekend, many of the USA’s future stars will compete in two events this weekend at the Jon M. Huntsman Center on the University of Utah campus in Salt Lake City. The 2018 Hopes Classic, which features athletes competing just below the elite level on Friday, July 6. On Saturday, July 7, 2017 World vault and floor exercise silver-medalist Jade Carey of Phoenix, Ariz./Arizona Sunrays, is one of the seven members of the U.S. Women’s National Team expected to compete in the American Classic. Tickets are still available through utahtickets.com. Fans who are unable to head to the Huntsman Center can watch all four competitive sessions live at USA Gymnastics YouTube channel. Both competitions are competitive qualifiers for women’s gymnastics: the American Classic, for the 2018 U.S. Gymnastics Championships in Boston in August, and the U.S. Classic later this month in Columbus, Ohio; and the Hopes Classic, for the Hopes Championships, held in conjunction with the U.S. Classic. The Hopes Classic and the American Classic both have two sessions, and the schedule, which is subject to change, is below. All times are Mountain Time. In addition to Carey, U.S. National Team members who are expected to compete in the American Classic are listed below. The complete field for both the Hopes Classic and American Classic are listed below. The Huntsman Center is partnering with the Utah Sports Commission to play host to the two-day event. Team members and alternates from the USA’s 2017 World Championships Team automatically qualified to the U.S. Gymnastics Championships. In addition to the U.S. and American Classics, national team members can earn a berth to the U.S. Championships by achieving the qualification score at a national team verification or international assignment. USA Gymnastics. Based in Indianapolis, USA Gymnastics is the national governing body for gymnastics in the United States. The organization is committed to creating a culture that empowers and supports its athletes and focuses on its highest priority, the safety and well-being of the athletes. USA Gymnastics has already taken specific, concrete steps to strengthen its safe sport policies and procedures. The organization’s disciplines include men’s and women’s artistic gymnastics, rhythmic gymnastics, trampoline and tumbling, acrobatic gymnastics and gymnastics for all (formerly known as group gymnastics). For more information about USA Gymnastics, log on to usagym.org. Alpha by state, last name; indicates level of competition.